One of the sites that we have had on our list for some time, as a possible CoHousing site, is the former Oxford University Press papermill site in Wolvercote. After outline planning permission was granted in December 2015 for 190 houses, the site finally went on the market early 2016. 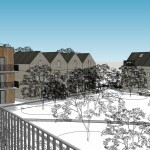 Great efforts were made for Cohousing to be included as part of a wider development on this site. 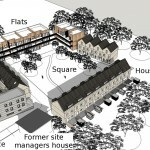 A new umbrella group, Homes for Oxford, bringing together representatives from Oxford Cohousing, Oxford Community Land Trust, and two housing cooperatives, worked hard to develop a credible bid with a developer partner. Our final bid was a masterpiece of community and sustainable living, which would have been a first of its kind in the country. Unfortunately, though shortlisted, we did not win. However we continue to pursue the possibility of part of the site being made available for a CoHousing community. In 2015 we bid for the Stansfeld quarry. Our bid was shortlisted but unfortunately not successful.